It's a Green Light for The First Night Riders' 2014 Dates! 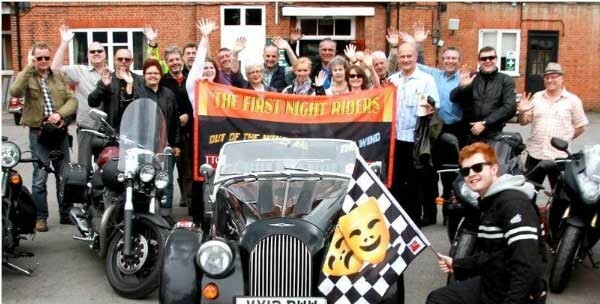 The First Night Riders charity motorbike and classic car adventure, which raises money to help The Theatrical Guild support backstage and front of house staff, has announced new dates for 2014. Organisers David and Brenda Edelstein, from track systems specialist Triple E, will be leading next year's event and are inviting riders and classic car enthusiasts to join them from 20-23 June 2014. Next year will be the fifth time the First Night Riders have toured the UK, setting off from a London location (TBC) and visiting some of the UK's most fascinating theatres and theatre suppliers. Last year, the intrepid gang embarked from London's iconic Roundhouse and travelled through the Midlands, visiting sites including the Oxford Playhouse, the Buxton Opera House, and Sheffield's Crucible Theatre. This year's route and stop offs are still in the planning stages but seaside theatres are high on the list. To date, First Night Riders has raised almost £50,000 for TTG's work, which offers support and financial assistance to those in need - for example theatre professionals who want to retrain or develop their careers, or to people unable to work due to accident or illness. "The First Night Riders' aim is to provide a fun way to get onto the open road for a good cause," says Brenda Edelstein. "Today, TTG's work is more vital than ever. It is important for the First Night Riders to raise the profile of this unique charity and support the help and advice it gives to men and women who work behind the scenes and front of house in the entertainment industry. Crucially, First Night Riders needs help from the industry to ensure TTG continues its remarkable work - and we need riders to join the group and get sponsored to support such a worthy cause!" David Edelstein continues: "I'm excited about the fifth ride for 2014, it's going from strength to strength, and we have a great bunch of regulars taking part from both the UK and overseas. This International group has a great time visiting all kinds of theatres in aid of a wonderful and very appropriate charity. Brenda and I are very proud to be organising this event, it's another example of Triple E's commitment to supporting the industry that supports them." In addition the inclusion of classic cars FNR 2014 is expected to enjoy a large international presence - previous years have seen riders joining from Canada, America, South Africa and Sweden. "The aspect of the FNR event that keeps me coming back is twofold,' says Robert Hamilton, Principle Theatre Consultant of DSD Theatre Design, Canada. "Number one is the people - It seems that these events attract first rate folks. The second is the opportunity to see many interesting theatres throughout the UK. I think I have seen about 40 theatres over the past four years, most of which I would never have seen without this event. "Theatre connects us as human beings across boundaries, oceans, and cultures; therefore it makes sense that a theatre charity event should attract interest and participants from afar. I certainly feel as strongly about contributing to a theatre charity in the UK such as FNR as I do when I contribute to similar causes closer to home." For the 2014 ride each rider will be asked to raise a minimum £500 sponsorship via their own Virgin 'Just Giving' page, £100 of which is a non-refundable registration fee. In addition pillion riders and chase car passengers can register for free, however donations are encouraged with all proceeds going to the TTG. There is also the opportunity to simply sign up for a day ride for enthusiasts who cannot do the full four days. In picture: next year's First Night Ride takes place 20-23 June, and organisers are inviting riders and classic car enthusiasts to join them.